This book is also available in PDF format. Conducting Searches,Gena Philibert-Ortega offers some insight into the importance of how you conduct searches. Using the FamilySearch Catalog, Gena Philibert-Ortega describes the importance of this much-have resource! Google Tools to get you Going, Gena Philibert-Ortega highlights Google’s tool set and how it can help you find your female ancestor. Locating Death records, Gena Philibert-Ortega looks at resources for locating the death of a female ancestor. searching City Directories, Gena Philibert-Ortega shows how you can follow your female ancestor through time. Finding Your Female Veterans, Gena Philibert-Ortega offers resources for finding your female ancestor who served their country. Female Immigrant Ancestors, Jean Wilcox Hibben examines why and how women took the gamble. Pinning Female Ancestors, Gena Philibert-Ortega looks at Pinterest and shows you how to use it to your genealogical advantage. Digitized Book Resources, Gena Philibert-Ortega recommends digitized book collections for female ancestor research. Church Records, Gena Philibert-Ortega shows how church records might illuminate your ancestor’s life. 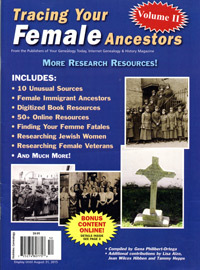 Ten Unusual Sources, Gena Philibert-Ortega offers up some lesser-known resources for finding that “difficult” female ancestor. Telling Your Females’ Stories, Lisa A. Alzo shows how to honor your female ancestor with a variety of ideas and the tools to make it happen!